Middle Ages Historical Spiked Battle Club | BUDK.com - Knives & Swords At The Lowest Prices! 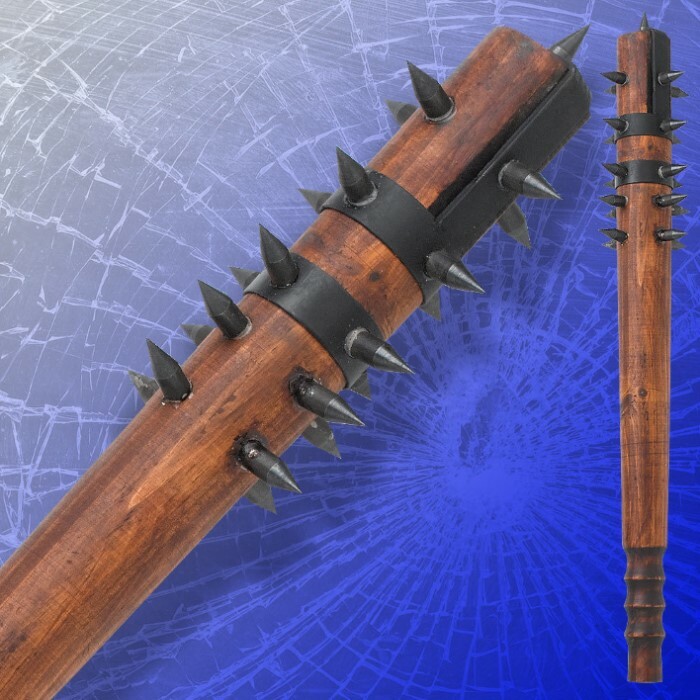 The wooden club was one of man's earliest weapons, and it gave the wielder the ability to literally crush his opponent. This fierce model gives that early weapon even more brute power and savage effectiveness! It features 21 metal spikes along its head and is made of incredibly strong hardwood. It also has a sculpted handle for a secure grip. This weapon will be a big hit at the medieval fair or with your favorite bunch of barbarians! I've owned mine for many years and I still love it every time I take it out. I didn't have any "glue-strings", mine looked great right out of the box. I inspected every single spike and they were all in magnificent shape. It feels great in my hands, I love the weight and size. I am looking forward to purchasing 5 more as gifts for my brothers. I am very happy with mine and would recommend it to every one that is thinking about buying one. It's a little bit head heavy. I wrapped grip tape on the handle. This is definitely a 2-handed weapon. If you can shoot an UZI one-handed like Arnold Schwarzenegger then this spiked club is a one handed weapon. I think a lanyard would be good for retention during lulls in battle. But I wouldn't use lanyard in battle for fear of spiking myself. Deffo a two handed club. It could use a revarnishing. I read some of the comments and I really look forward to buying this thing. I could easily scrape up enough money to buy it. A lot of people said that there were glue strings everywhere. I really wouldn't mind it because when you're attacking something and trying to kill it, I don't think that it would make much of a difference. I absolutely love this weapon! strong and durable, and very nasty looking! a wonderful piece for a wonderful price! wow! the quality is really good for only 20$ and it does a lot of damage! in my opinion there is no down side to this product. BRUTAL. 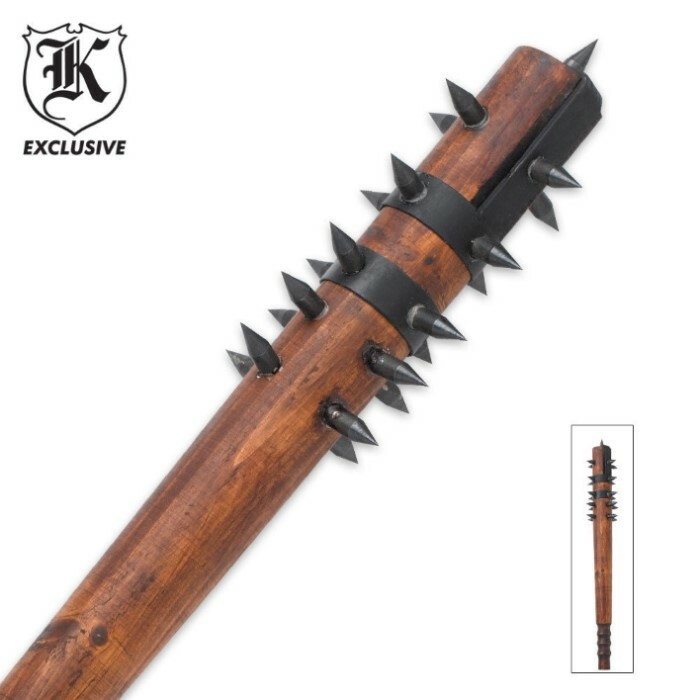 this looks home-made which is perfect, it looks nasty it is nasty, the spikes are rough and sharp not cosmetic and smoothed they'll rip your clothing if you snag it - this is a good thing on this kind of weapon. this weapon has only one flaw - the bottom needs a knob like a baseball bat has, for hanging on to it, i'm gonna make up something for that myself then cover it all up with griptape or similar. Intimidating and formidable, this club was a fantastic value at under $20. The hot glue residue mentioned in earlier reviews peeled off easily. This club was designed for incapacitating living things and as such the spikes are sufficiently secured. This club is a cool addition to any man cave. Friends can't help but want to check it out. Serious intimidation stick. Up close it loses some of its "WOWness". The spikes and metal work is nice but the club itself could have been done a little better. I had to clean off hot glue and some wood splinters around the drilled holes & the stain looks cheap upclose but other than that it's a pretty cool thing to have.This club with the matching Midevel Hammer hanging behind the bar is truely something people will remember and talk about. Nobody I know has anything like it. Spikes are very sharp and one of them had fallen out in shipping but was easy to reinsert with some wood glue and super glue. It is very top heavy with the spikes and could use a wrist strap for added security but very much worth the $20. It does have some excess adhesive on it but nothing that 5 min. of work couldn't fix. Overall very nice for the price.